Beautiful, breathtaking, relaxing and fulfilling... Share the elegance and beauty of this fully restored historic 1750's hidden jewel and luxury pre-revolutionary waterfront estate. The Waterloo Country Inn is listed in the National Register of Historic Places. The Waterloo Country Inn offers elegant and comfortable rooms. Two luxury suites, four charming rooms, handicapped accommodations, jacuzzis, fireplaces, all private bath, telephone, TV, AC. Complimentary full breakfast. Dinning with an European Flair by request in advance only. 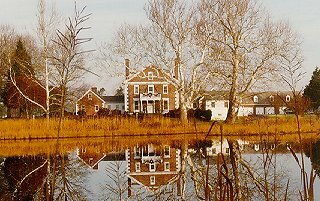 The Bed and Breakfast is situated on a tidal pond, a habitat for wildlife and birds, with trails for walking. Canoes, bicycles and an outdoor pool give you the opportunity to be idle and enjoy the serene and peaceful atmosphere. The setting of the Waterloo Bed & Breakfast is an inspiration for a romantic getaway and vacation. Nestled in a rural setting, yet just a short distance from the beach Chincoteague, Assateague, known world-wide for their wild ponies, and Crisfield, Smith and Tangier Islands with fishing and boat trips nearby. Antique shopper's paradise. Several golf courses are close by, one just a ferry ride away. No smoking, Visa, MC, Amex, Discover, Checks. Children OK. Pets allowed. This and other Maryland Bed and Breakfast Inns can be found here in The Register.